If you’re in need of a tool to help you or your team manage tasks and collaborate on projects there’s no shortage of free or inexpensive Web-based platforms available. But often managing the project management tool becomes a project in itself. DropTask, a free visual task management Web app that launched in February, offers a more intuitive way to monitor and manage workloads. With its circular-themed dashboard DropTask gives you a birds-eye view of who’s been assigned what tasks; due dates; and the status of a task through play, pause and check symbols that indicate whether something is not started, in progress, on hold, or completed. The tasks that involve the most work are represented as larger circles within a group, with less-complicated tasks represented as smaller circles. While this circles-within-circles theme takes some getting used to, it works well if you’re a global or strategic thinker who wants to quickly grasp work distribution. For example, let’s say your company is launching a new product. Each large circle, or group, could represent a function such as marketing, IT, or human resources with the smaller circles symbolizing various tasks each has been assigned. Or groups could represent clients with inner circles expressing what needs to be done for each of them. Birds-eye view of tasks grouped by function. To assign tasks to others you can drag team member photos on the left onto a task or choose team members through a pane that pops up on the right of the screen when you click on a particular task. Within it you can also add a due date, tags, or files. Most helpful, however, is the ability to add subtasks. When someone checks off subtasks on the right, sections of the outer rim of the task light up to indicate progress. Again, for people who don’t want to pore over written updates and lots of words this is where DropTask shines—its ability to give a user a quick visual sense of task status. Highlighted sections of a task’s circular border show progress. Users can request an update from others, who can respond by clicking on a link in their email or in the Notifications tab within DropTask. Google users will especially appreciate Google integration with DropTask so that every due date you set in DropTask shows up on your Google Calendar and any to-do lists in Google Tasks automatically morph into Groups within DropTask. DropTask also lets you attach files to a task using Google Drive or Dropbox—changes team members make to a document show up in the cloud in real time so you never have to worry about version control. You can also attach files from your computer to a task. That said, DropTask will be less appealing for folks using Outlook or some other non-Google information manager because it lacks its own built-in calendar. You can certainly view tasks in a list according to when they’re due, but with DropTask you won’t get the kind of rich calendar features you’ll find in more robust collaboration products such as Basecamp. You can choose to receive email notifications from DropTask at varying intervals—as a daily summary or whenever anyone on your team does anything such as complete a task or make a comment. And if you don’t care for the circle view you can switch to a list view according to priority, due date, or various filters such as team member, tasks not yet started, or which ones are overdue. DropTask’s list view filtered by priority of tasks. Without built-in calendaring, Gantt charts and timelines, DropTask is more of an individual or team task manager than a full-fledged project management solution. Also, if you like to update projects on the fly using your smartphone or tablet you may be disappointed that at the moment mobile apps for DropTask do not yet exist (although the company says they’re in the works). DropTask does have a mobile-optimized site that works fine on a mobile browser, however. Another knock, which may or may not be important to you depending on how you work, is DropTask’s all-or-nothing permissions. If you invite someone to a project they can see everything you do within it meaning you can’t hide certain things from clients, such as internal discussions, project mock-ups or other behind-the-scenes activity. 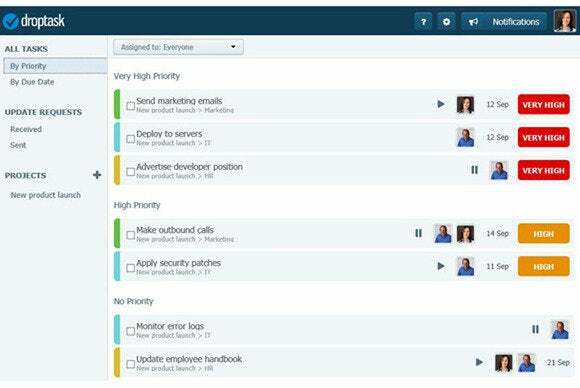 Some other platforms such as Basecamp let you hide messages, to-do lists, files, events, or documents from clients. Linear thinkers, in particular, may be completely uncomfortable with DropTask’s simple, high-level geometric approach to task management. For them, a collaborative task management application such as Asana might be better because it drills into data horizontally, using a three-column format to represent a list of projects on the left, a list of tasks within a project in the middle as well as detailed information about a task on the right. 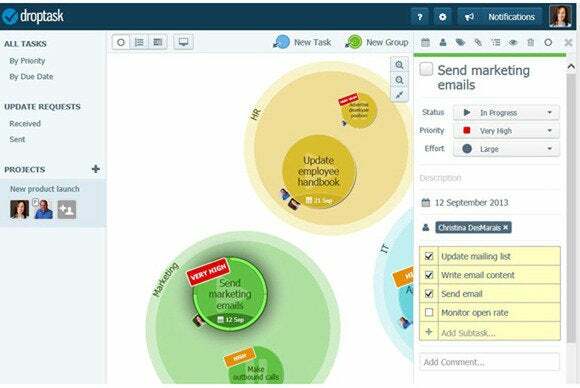 But for businesses or individuals who don’t need to let clients behind the curtain and prefer high-level reports over detailed status updates, DropTask is a fresh and uniquely visual way to manage tasks. With its drag-and-drop simplicity and ability to communicate a lot of information at a glance, it’s worth checking out, at least if you’re a global thinker who can do away with the typical lists-within-lists format many other task management solutions employ.